First of all Ms. Mannequin gave me a hard time while putting on her clothes... she rocked back and forth and side to side... then she wouldn't keep her arms straight... so I had to do it... she hates when I disassemble her... thats right I remove her arms... b/c she just wouldn't stay still... ... maybe its me.. but why does it look like she giving me the middle finger....jeez... why doesn't she understand that its paparazzi time... and that she must look perfect for the photo shoot. Ok thats done... now let me tell you crocheting sleeves straight from the armhole is tedious... round and round and round you go. Well I am glad to say its over with. 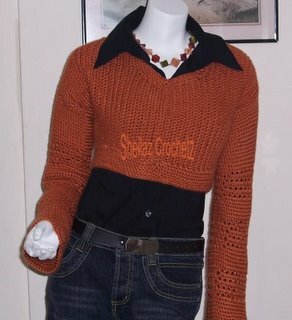 This piece was worked up using Caron Simply Soft yarn. The stitches I used were half double crochet, single crochet, and then I did a band of sc then a band of sc, ch1, sk1, sc.. just to add a little somthin, somthin to the sleeves. 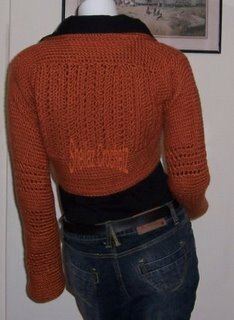 The back was also done using the same stitches. Well on to my next WIP... which needs a little tweaking. I love the detailing at the sleeves! Even with an uncooperative model (lol) it looks fantastic. Think we previously met as part of BCG - glad to have found your blog. Keep up the good work!! Thanks so much for the compliments... Robyn - as you know by now I am totally loving the Kimono Reinvented.. Deneen your daughter should have one very soon... Debva your cross stitch work is phenomenal. that is one sassy mannequin. the final product looks fabulous - i especially like the detailing in the sleeves. Awesome. I envy you whipping out these tops without a pattern. BTW thanks for the tips on lining a bag. Do you have a pattern for the Lil' Black Tank? That is gorgeous! 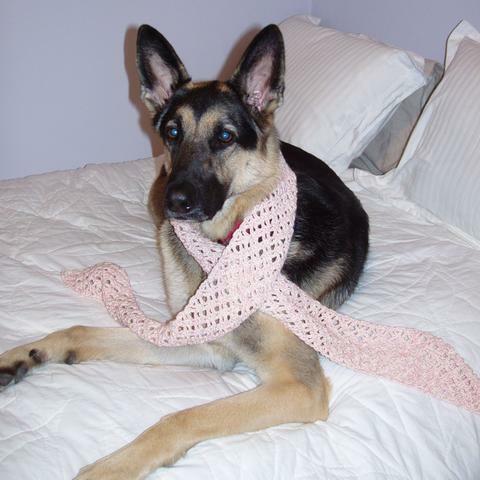 I would love to crochet one if you have a written pattern. Great designs.